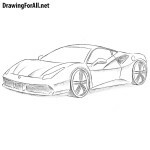 Hello dear artists and welcome to the drawing lesson about how to draw a Honda NSX step by step! 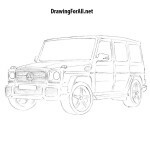 As we said earlier, we really like cool cars and will gladden you with new drawing lessons on this topic as often as possible. So, let’s get started! As always we start with common lines. With the help of very light and straight lines sketch out the car body. 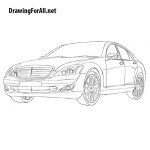 Draw the mirrors, wheel arches and wheels with the help of curved lines. Note that in the first steps the lines should be very light. So, let’s start adding details. With the help of straight lines draw out the angular headlights and a radiator grille. In the same step draw the hood. Using the same straight lines draw out the bumper with air intakes and the bottom of the radiator grille. The top of the Honda NSH is less angular than the bumper. Thus, using slightly curved lines draw the roof, windows and mirrors. Continue drawing Honda NSH. Now draw the door, the handle on the door, the rear of the car and air intake. Now, very carefully draw out the round wheels and arches. Inside the wheels draw the rims (which as always can be of any shape). Drawing lesson on how to draw Honda NSX came to an end. If you have visited our site for the first time, be sure to visit and subscribe to us at Google Plus, Facebook, Pinterest and all other social networks to always be aware of new drawing lessons. 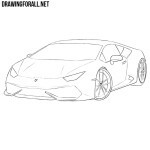 Also be sure to visit our category “Cars” where you will find many drawing lessons, for example about Ferrari, Lexus, Maserati and so on (we are sure that you will like these lessons).